If you’re as obsessed with Instagram as I am, you may have seen the galaxy donut trend that’s been swirling around social media for the last few months. Galaxy donuts are everything dreams are made of. They are sweet, beautiful, and oh so whimsical. However, since I can’t trust myself around anything sweet (I literally ate an entire apple galette the other day), I decided to give this galaxy trend a whirl but with bagels. I can control myself around bagels. The first step of this project? Tracking down ingredients. I ordered edible glitter from Amazon and found black sesame seeds in the bulk food section of my local health food store. If you’ve never made your own cashew cream cheese before, don’t fret. It’s SO easy and also cheaper than buying vegan cream cheese at the store. And did I mention it’s insanely delicious? Take breakfast from boring to interstellar with these Vegan Galaxy Bagels. Easy homemade cashew cream cheese swirled with sweet black tahini makes these bagels every bit as delicious as they are beautiful. Make Ahead: Soak the cashews for 4 hours or overnight, then drain. You can also boil them for 10 minutes to speed this along. In a food processor, combine the soaked cashews, non-dairy yogurt, and sea salt. Process for 5 minutes until smooth, stopping often to scrape down the sides. If the mixture is too thick, add 1 tablespoon of water at a time to assist blending. Prepare a glass container by cleaning it thoroughly, then rinsing it with vinegar to remove any soap residue. Transfer the cashew mixture the glass container. Cover the Cashew Cream Cheese and leave sitting at room temperature for 12-48 hours. Use a clean utensil to taste of Cashew Cream Cheese every 12 hours or so. As soon as it gets tangy, place it in the fridge. The cashew cream cheese will keep in an airtight container in the fridge for up to 2 weeks or in the freezer for up to 4 months. Makes 2 cups. In a food processor, combine the black sesame seeds and agave nectar. Process for 5 minutes, stopping often to scrape down the sides. If the mixture is too thick, add water 1 tablespoon at a time to assist blending. Toast your bagels. Swirl 1-2 tablespoons of Sweet Black Tahini with the same amount of Cashew Cream Cheese on top of the toasted bagel halves. Use a spoon to make a pleasing design. Finish your Vegan Galaxy Bagel off with a generous sprinkle of edible glitter and Enjoy! The inspiration for these Vegan Galaxy bagels came from an Instagram account I’m super obsessed with @sobeautifullyraw. Sam is a vegan chef from Melbourne who makes the most stunning vegan desserts ever. I also have to give a shout out to my friend Josie from Sugar and Satire who made baked galaxy donuts. Hers looked delicious and definitely inspired me to give these Vegan Galaxy Bagels a try. Thanks Josie! These Vegan Galaxy Bagels were so much fun to make! They turned out so pretty, I almost didn’t want to eat them. But then I did and they were super tasty too. Let’s be honest, beautiful food tastes better, right? 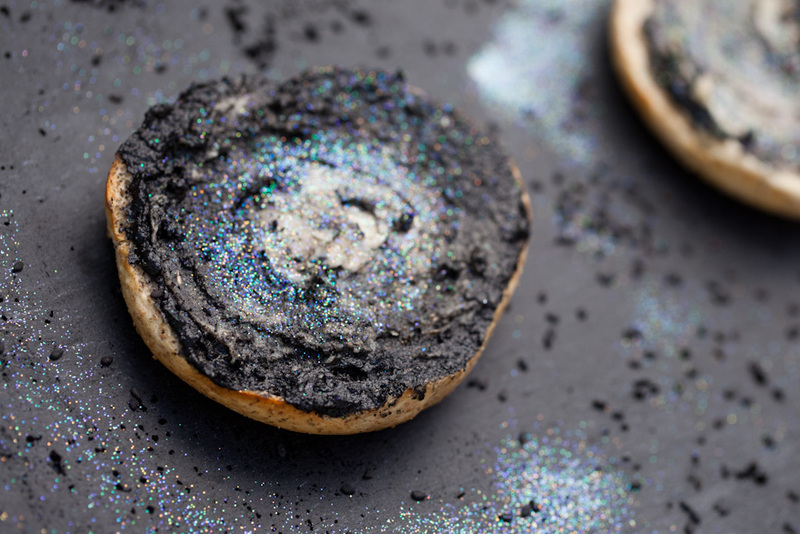 Did you try this Vegan Galaxy Bagel recipe? Leave us a comment and tell us about it! Better yet, post a photo to Instagram with the tag #carrotsandflowers so we can admire your creation! For other delicious vegan breakfast options, check out our NY Style with Tomato Lox or our Mac Daddy Vegan Breakfast Sandwich! If you want to save this recipe for later, pin the photo below! These look amazing! I’ve never made bagels before but now I’m excited to try. Can putting edible glitter on everything be a thing now? My body is ready.